We were heading north and with several routes to choose from, we decided to drive up to Yucca Valley then through the Lucerne Valley to get us on our way. The day was warm and sunny and the quiet roads are easily traveled in this part of the state, which is lightly populated. Southern California had a very large migration of these orange butterflies, call the painted ladies and they were totally unavoidable as we drove. 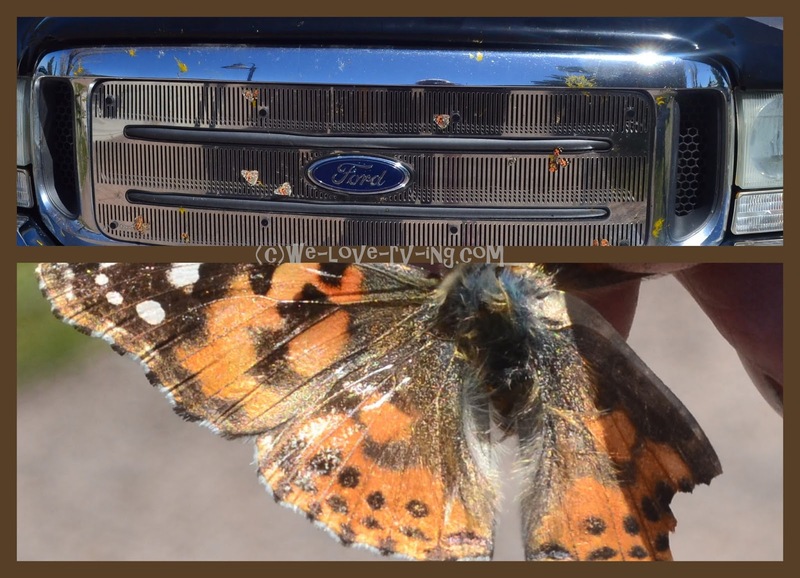 Poor little fellas were covering every grill driving in southern California. We’d not seen them in the swarms that others had seen but I’d seen many pass by our RV earlier in the month. Scientists estimated there to be millions of them. The season had offered plenty of rain that caused the plants to thrive therefore create these numbers. I do not ever recall seeing an Airstream motorhome like this, such a vintage look to it. I tried to find out when these were made but had no luck with that. The closest I’d seen were pull behind trailers and there are more of them all the time, a very popular trailer, in early days, before it was even called RV’ing. We left Hwy 247 at Barstow and followed Hwy 58 crossing the Mojave Desert. The Tehachapi is such a pretty valley to drive through, especially early morning with the mist hanging on the hills. There are nine tunnels for the trains that follow this route, a very unusual route for trains. A long train passes over itself going around the loop. I’ve never timed that sight to be able to get a photo but have seen many trains follow the track. It was definitely an engineering feat of its day, opening in 1876. It was designated a California Historical Landmark in 1998. It had been many years since we had followed Hwy 99 as it passed through so many smaller towns and that meant lots of stops and starts. Just before we left to head north, we learned that the freeway now passed right by that and there were no stops so we decided we would take this different route and got onto that at Bakersfield. 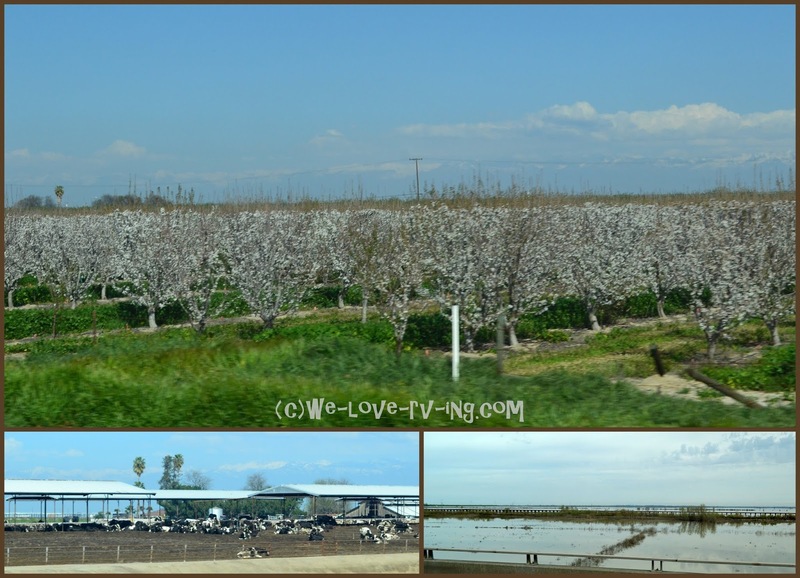 There are many agricultural sights to see on this route including several cattle farms, almond orchards as well as fruit orchards and also rice fields, like many sights on I-5. The drought that had been happening for several years has been helped with the rain that has more recently happened and the fields and orchards look much happier than normal, even though it was still early in the season. Wild turkeys are making a comeback in California after some over hunting years. There are conservation efforts that have helped to make that happen. They like forested areas with pastures and orchards nearby so this was a great neighborhood for them. They like to roost high in trees as night to avoid predators as they have poor eyesight in the dark. Sadly fires had done a lot of destruction in the hills as we now followed I-5. 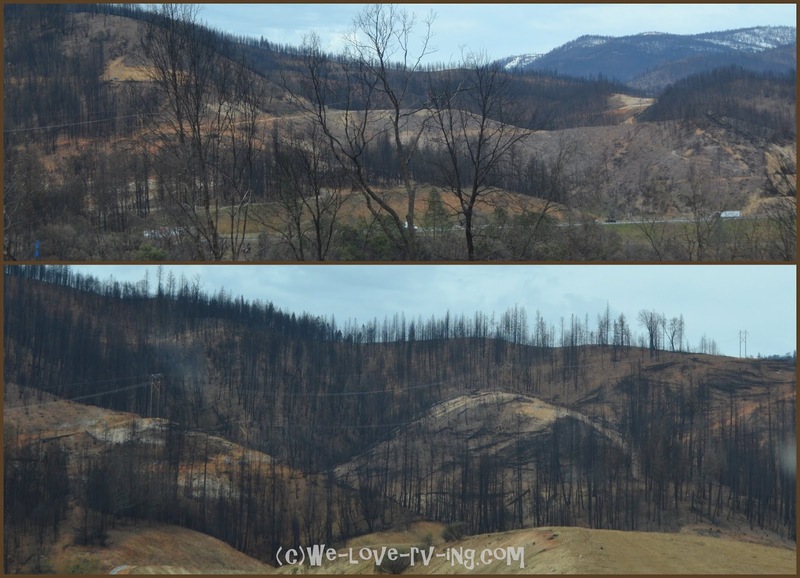 The Shasta County area had a lot of charred trees that could be seen from the highway. This fire was one of several in California that caused a lot of problems during the summer of 2018. There is often a difference in the level of Lake Shasta but it looks good this time. Always a nice sight to see no matter the height, and not unusual to see some boaters out there fishing. Click here if you wish to view some of the sights we saw on our travels home last year. We took a different route for part of the way.